Marcus Chown is well known for his books about astrophysics and anything else related to the universe, but in his latest offering, What a Wonderful World, he leaves his own galactic turf to explore other areas of science, and even a little bit of economics. He does so with the same easy eloquence that has distinguished him as a science writer who can explain even the most baffling concepts simply but satisfyingly. The book is structured in five sections, explaining first how we work, then how the society we’ve created works (including a short excursion into economics and political systems), how the planet works, how matter (big or small) works, and, finally, how the universe works. As Chown moves through the increasingly complex layers of interconnectedness, he frequently acknowledges humanity’s impact on Earth, but he takes a long-term perspective, thinking in terms of the life span of our planet and our Solar System, rather than human generations. It begins with the discovery, structure and function of cells, the building blocks that make up any living creature from a single-celled bacterium to the trillion-upon-trillion-celled us. I remember, back in my days as a student of biology, working my way through a 600-page tome on everything you ever wanted to know about cells, so when I got to the end of Chown’s 14-page chapter my first thought was “Is that all?”, quickly followed by “Actually, it is”. This is what Chown does so well. In a few pages he manages to distil the essential bits of information to give somebody who’s new to a subject enough to understand it, while still keeping those who think they might know something entertained and surprised. It applies to all chapters. Each topic he tackles has had volumes written about it, yet the way he weaves anecdotal and factual information together creates new connections, new understanding, that carry the reader through some of the denser sections. Chown is fearless when it comes to explaining the nitty gritty of his subject. Where else would you find the actual two lines of DNA sequence that illustrate that there is, in fact, one short string of biological code we share with every other thing that has ever lived, right back to giant viruses and the boundary of life as we know it? When things do get more complex, Chown helps the reader out with well chosen metaphor and analogy. My favourites? Using food ingredients and recipe instructions to explain how structural and regulatory genes interact, describing neuronal networks as a cellular telephone system, and the image of a pulsar that sweeps a lighthouse beam of radio waves across the sky. 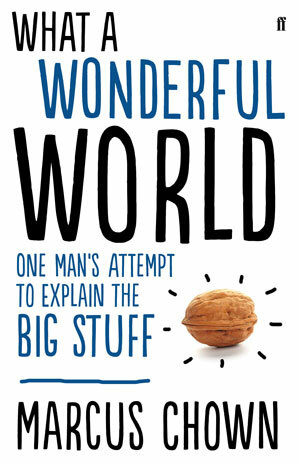 There are also plenty of quirky facts that make What a Wonderful World an easy read, despite the complex subject matter. Did you know, for example, that you and I have as many hairs per square centimetre of skin as a chimpanzee? It turns out we only look like naked apes because our hair is shorter and less coarse. The one flaw in this book might be an issue with editing rather than writing. I lost count of the number of times I read the same explanation of pressure, using a description of atoms drumming against a surface like “rain on a tin roof” – and that is just one example of repetition that became a little annoying. However, I particularly enjoyed the way Chown manages to connect almost everything back to the universe. Whether it’s the comparison between the number of neurons in your brain and the number of stars in the Milky Way, or the connection he draws between the groundbreaking achievements of Copernicus and Darwin (with one demonstrating that the earth is not at the centre of the world, and the latter showing that we are not the centre of the world either, far from it), it’s as if Chown cannot hold back his inner astrophysicist. And that sort of enthusiasm makes for good reading!